There were semi-final victories for PS Chorca Dhuibhne and St Brendan’s Killarney today. Ruaidhrí Ó Beaglaoich was part of the winning PS Chorca Dhuibhne team. IT WILL BE an all-Kerry clash once again in the Corn Uí Mhuiri final this year in Munster after PS Chorca Dhuibhne and St Brendan’s won their respective semi-final ties this afternoon. Dingle-based outfit PS Chorca Dhuibhne saw off Rochestown College 0-13 to 2-6 in Fitzgerald Stadium while St Brendan’s Killarney ran out victors by 2-11 to 0-8 against Clonakilty Community College in Cill na Martra. PS Chorca Dhuibhne made all the early running to go in front 0-7 to 0-0 by the interval before pushing on to lead 0-9 to 0-0 after 40 minutes. Then Rochestown College rallied with goals from Adam Cantwell and Ray Halloran helping leave them 0-11 to 2-2 adrift entering the finale. 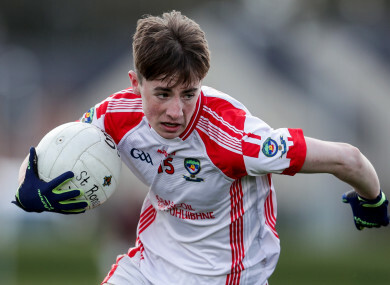 PS Chorca Dhuibhne, who had Kerry All-Ireland minor winners Ruaidhri Ó Beaglaoich and Dylan Geaney in their forward line, were in front 0-13 to 2-2 by the 56th minute and despite the Cork side reeling off the last four points of the game, time ran out on their challenge as they attempted to draw level. St Brendan’s, who were convincing victors over Clonakilty in the group stages, moved in front 1-5 to 0-4 at the break and added a second goal early in the second half before claiming a nine-point success. It will be the first time the two schools have faced off in final of the premier colleges football competition in Munster since 2013. They met at the semi-final stage last year with PS Chorca Dhuibhne running out victors and subsequently lifting the title. Between they have carved up the last seven titles at this grade since 2012 with PS Chorca Dhuibhne winning five and St Brendan’s lifting the crowns in 2017 and 2018. The final takes place on Saturday 23 February. Email “Dingle and Killarney sides set up Kerry clash in Munster Corn Uí Mhuirí final”. Feedback on “Dingle and Killarney sides set up Kerry clash in Munster Corn Uí Mhuirí final”.